I finally registered for the N.S.W. & A.C.T. Association of Family History Societies Inc. Annual Conference 2016 in Camden, Cow Pastures and Beyond. I missed the earlybird registration as I was having too much fun flitting around Iceland to bother about such things as geneaconferences at home. If you haven't registered yet you had better follow my lead as registrations close on August 21. I am particularly excited about this event as it is taking me back to the home of my convict ancestors in the Camden area, Patrick Curry and Ellen Moore. Patrick was assigned as a shepherd to James and William Macarthur in Camden and, when he gained his freedom, he continued to farm in the area. I was alerted to one of my most precious family history documents that is about Patrick by Alan Atkinson in his book, Camden: farm and village life in early NSW. I'm excited that Alan will be delivering the John Vincent Crowe Memorial Address at the conference. It's always difficult to prepare a program for such a conference and provide something for all comers. I am also looking forward to hearing Nick Brodie author of Kin (read a review here https://residentjudge.wordpress.com/2015/09/28/kin-by-nick-brodie/) which I must read before the conference. I always enjoy hearing from Heather Garnsey as she has so much knowledge and many good ideas to impart. As for the other speakers, I'll just have to wait and see. As one of the organisers of The Hornsby Shire Family History Group I will be part of the trade exhibition at the conference. Our Group doesn't have anything to sell but we are grateful to the organisers for giving us an opportunity to promote our group and meet people with links to The Hornsby Shire. 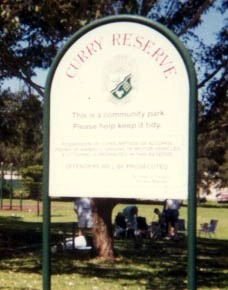 Another job I have while in Camden is to take some better photos of Curry Reserve that was named for members of my family. Those I took last century aren't tog good. Most of all I love events like this because they give me an opportunity to reconnect with my genimates in the flesh and put faces to names I've heard over the years. Will I see you in the Cow Pastures? Sorry to hijack your comment Tiphanee, but it's the only place where I can add a comment Jill. I'm going, too. I booked early and forgot, so emailed them to check. Brain fuzz.